Last week we discussed setting up your Google Analytic account this week we are going to check out our data. 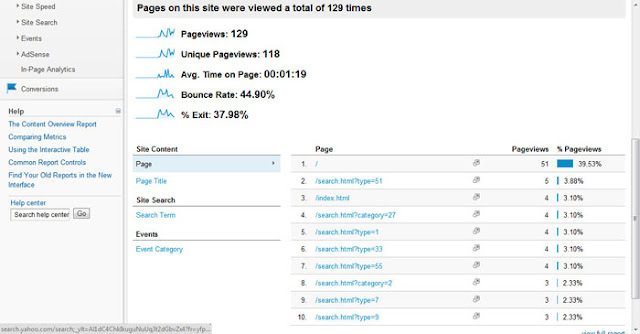 It takes some time to collect data but at some point you will collect enough info to see what site visitors are doing. Go to http://www.google.com/analytics/ and log into your account. If you have several sites set up you will see a list of sites to choose from. Select your site to launch the analytics dashboard. Notice the left side has navigation, and the right area has the data. By default you go into the overview. You can dig deeper by selecting a category from the menu choosing from: Audience, Advertising, Traffic Sources, Content and Conversations. We are not going to dig into Advertising or Conversations right now because both require additional setup to even record any data. For Advertising you could set up an AdWords program and track the success, and for Conversations you could set up goals and custom reports. Since we did not set any of this up yet we don’t really have any data to look at. Clicking on Audience will open several sub-categories, you can dig deeper in the navigation or click on topics beneath the graph. 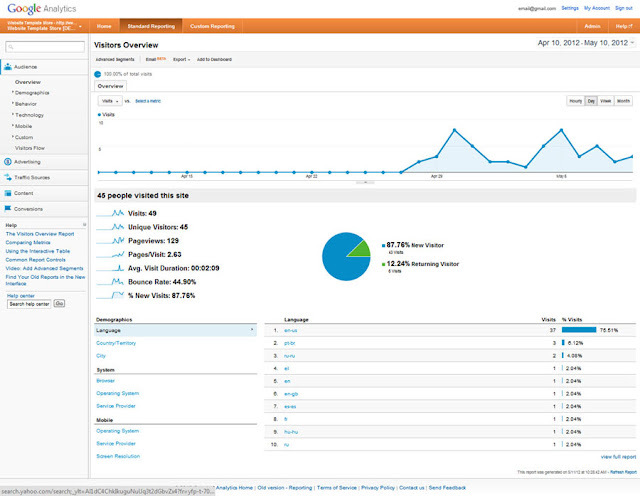 Getting an overview of Audience data showing how many visitors you have. Beneath the chart there are numbers for Visitors and Unique Visitors. A Visitor is anyone coming to your site. A Unique Visitor is a new visitor instead of someone that has been there before. You can scroll down a little more to learn more about your visitors. Knowing things like: country, language, device, internet provider, operating system and even screen resolution can come in handy in future site development. Just click on the topic and see the detail to the right. Traffic Sources tell you how your visitors found you. They could be Direct Traffic which means they just typed in your URL, Search Engine is finding you in a keyword search, and Referral Traffic is following a link from another site. Beneath that you dig deeper by selecting Keywords to find out what search terms were used to find you. In addition you can find which search engine was used, what referring sites are linking to you, and which page visitors are entering on. Content will show pages being viewed and search terms can be very helpful to see how people are searching to find you. You can use this information to target even more of your market. This was a general overview of all you can do with Google Analytics. Really a lot to see so click around and discover who is visiting your site!